Source: Center for Mennonite Brethren Studies. Central Heights MB Church, 1966. Central Heights Church began when the South Abbotsford Mennonite Brethren Church became overcrowded and the membership decided to establish a daughter church, which was then called the Abbotsford Mennonite Brethren Church, later named Central Heights Mennonite Brethren Church (1966), and, subsequently, Central Heights Church (1991). 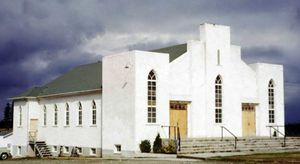 Organization of the new church took place in January 1950, when 197 members transferred from South Abbotsford to the new congregation. Henry H. Nikkel is considered the founding leader of the group. Land for the new church was acquired from Henry Hooge and in the summer of 1949 construction began on a sanctuary. By 1 January 1950, with the help of volunteers, the basement was completed and the congregation had a place to meet. On 6 April 1951 the upper sanctuary was completed. Many additions were made to the church sanctuary as it grew. 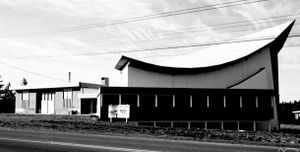 On 20 March 1966 a second sanctuary (now Nikkel Hall) was completed, and the congregation changed its name to Central Heights Mennonite Brethren Church. In 1967, renovations to convert the 1950 sanctuary into a Christian education building were completed. In 1974 an overflow area for the sanctuary was built as well as a gymnasium, and in 1979 a two-story education wing was completed. A new 1,578 capacity sanctuary was completed in 1985. 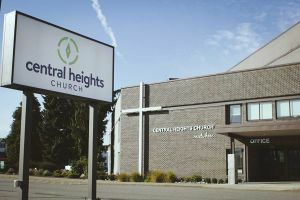 Over the years Central Heights has played a role in the planting of other Mennonite Brethren congregations in the Abbotsford area. Northview Community Church had a number of founding members who came from Central Heights when it started in 1980. In 1991, the congregation experienced a division over leadership styles, and a number of families left with the pastor, Herb Neufeld, to start Mountain Park Community Church. In October 1999, Northside Community Church in Mission was helped with its start-up by Central Heights families. In June of 2000 the Central Heights Korean Ministry began holding services at Central Heights. On the evening of 25 April 2008, the floor at the front of the sanctuary collapsed during a concert. During the following two years, the church gathered in Nikkel Hall, holding three services a week. The sanctuary was eventually repaired and on 27 June 2010 the congregation held a special thanksgiving service to mark their return to worshiping in the main sanctuary. Central Heights was the first Mennonite Brethren church in the Fraser Valley to use English in its services. When services first began they were bilingual while evening services were in English. By 1959 the services were all English. In 2010 the congregation had 1,023 members and an average weekly attendance of 843. In 2015 the congregation had 805 members and an average weekly attendance of 698. Canadian Mennonite (24 November 1961): 20. The Lord Builds His Church: A History of the Central Heights Mennonite Church Prepared for the Celebration of its Silver Jubilee, 1950-1974. Abbotsford, BC: The Church, 1975, 21 pp. Mennonite Brethren Herald (27 May 1988): 24; (24 August 1990): 23; (17 July 1992): 18-19; (10 September 1993): 18; (August 2010): 22. Wiebe, Henry and Elvira, eds. Celebrating God’s Goodness…1950-2000. Abbotsford: Central Heights, 2000. Klix, Waylon and Andrew Klager. "Central Heights Church (Abbotsford, British Columbia, Canada)." Global Anabaptist Mennonite Encyclopedia Online. June 2011. Web. 26 Apr 2019. http://gameo.org/index.php?title=Central_Heights_Church_(Abbotsford,_British_Columbia,_Canada)&oldid=162211. Klix, Waylon and Andrew Klager. (June 2011). Central Heights Church (Abbotsford, British Columbia, Canada). Global Anabaptist Mennonite Encyclopedia Online. Retrieved 26 April 2019, from http://gameo.org/index.php?title=Central_Heights_Church_(Abbotsford,_British_Columbia,_Canada)&oldid=162211. This page was last modified on 11 October 2018, at 18:37.